Two fashion weeks down and both New York and London, have put on some stunning catwalk shows for us! Whilst Milan Fashion Week kicked off yesterday with Alessandro Michele’s SS18 extravaganza for Gucci, let’s take a look back at the trends which made the biggest impact on the runways. Sparkle next year with the hottest trend that doesn’t seem to be disappearing anytime soon; Silver! Make a statement simple, with sequins and glitter this SS18. There will be plenty of options to choose from next year, so keep your eyes peeled! It started with flutter sleeves, then graduated to peplums, now, ruffles are taking this year by storm. This statement doesn’t seem to be going anywhere anytime soon, so stock up whilst you can! This transparent fabric is now a layering hero. If you like to show a little, but not too much skin, then SS18 will be the time to do it. Thanks to peek-a-boo sheer materials, you can now look elegant and hot at the same time. 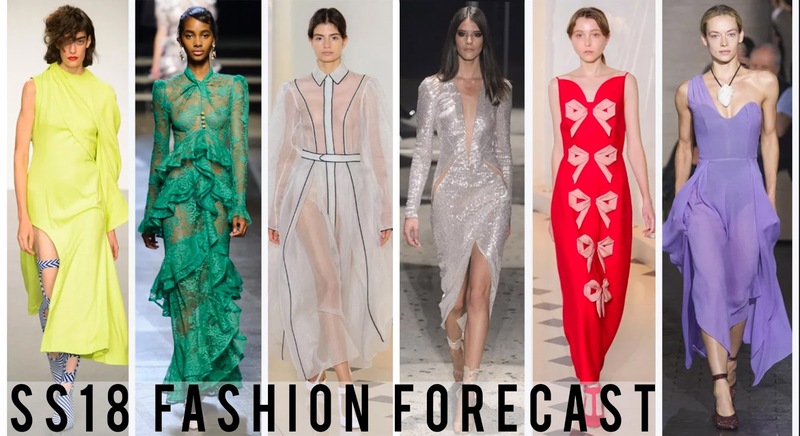 Whether you choose to style sheer under or over your opaque wardrobe staples, this trend will be a must have for the upcoming season. Typically clashing colours are considered a fashion faux pas, especially styling red and pink together. However, this trend has appeared to got the thumbs up from London. This could be a match made in heaven for SS18 and should be making an appearance in the high streets and your wardrobe next year. Deep cuts could also be a big thing for next year’s SS18. Whether it’s low plunging necklines or long slit dresses/trousers/skirts, this is definitely something to keep an eye on. For SS18 we will be filling our wardrobes with the softer side of the colour spectrum. There will be plenty of sorbet shades to choose from. Sometimes less is more and this will definitely be reflected in next years Fashion designs. It looks like there are going to be a lot to look forward to next year! So keep an eye out for the latest trends and get ready in time for SS18! Stay tuned into SS18 Fashion’s trend with Milan’s and Paris’s Fashion shows, in the next two weeks.